Previously, we evolved into the form of “beasts,” generation after generation, as degree of Reshimot “rolled” from one desire to another desire, and these desires received the sensations of the bodies in which they were found and created a picture of the world. However, now we have received permission to rise through the wisdom of Kabbalah to the level of the eternal world. So, we no longer will be limited by physical incarnation. This sequence of physical life and death will disappear, for we will see in this only a particular level of the general system. When I asked Rabash at the beginning of my study about what life and death in our world are, he answered, “This is like when you take off a shirt at night and put on a new one in the morning.” In an identical manner, you take off this life and are clothed in a new life, from one system of ten Sefirot to another system of ten Sefirot, and when you are found on a higher level, you don’t feel anything special about this. Similarly, a body found on the beastly level doesn’t feel pain when cutting hair or trimming nails, because they are found on the vegetative level. A lower level doesn’t feel a deficiency. On the contrary, its renewal is felt as a nice addition. So, it follows that for humans in our day, there are chances for rising to the eternal world before their conclusion of this life, and then they will see the present reality as an “appendage” of the eternal world. However, it is very difficult to explain this. Permission is given and we must act, but difficult work is required before we can implement this task properly. We need to make the access to the method easier for the world; we must be on a higher level and make the right connection between the levels. This is called being a teacher and beginning to raise humanity upward. We need to see this as our task, our obligation. The essence of the permission is not just that we are allowed to realize it, but it is our role and responsibility to do so. Baal HaSulam, “The Teaching of the Kabbalah and Its Essence”: The greatest wonder about this wisdom is the integration in it: All the elements of the vast reality are incorporated in it, until they come into a single thing—the Almighty, and all of them together. All the beauty, richness of understanding, attainment, and feeling stem from the combination of details. On our own, no one will give us a true inspiration. It is only when I connect distant, opposite things and suddenly they complete each other. This mutual compensation of polar phenomena inspires me. Everything starts from separation, hatred, alienation, from a complete inability to coexist, and suddenly I see that compensation comes due to this, that no one is complete without others. Everyone comes together, and then, according to the power of separation, I feel the power of unity, the power of oneness. The breaking brought us to splitting, scattering, hatred, and antagonism at different levels. We reject each other, are ready to destroy and to kill each other, and it is even more so in the spiritual world. There, the forces of the right and left lines act at an immeasurably larger scale, and each time a person must build the middle line in order to gather and unite all the parts together. This brings the Light to all the worlds 620 times greater, and this brings the Creator pleasure. So, on the one hand, the created beings reveal the darkness, and on the other hand, they come out of the darkness into the Light. However, this is a special light because they, themselves, generate it, discovering a gap and rejection, and then revealing unity and completion. It did not exist previously. One thing is the Light that corrects the created being and another is the goal of creation. It is awakened only in the one who feels this whole process himself. Therefore, it is impossible to attain revelation without desire, need. We must go through all the details of perception to open every door. This is the miracle that is inherent in the wisdom of Kabbalah. We reveal the contradictions and their mutual compensation. This is the greatest gift, prepared for us by the Creator, and from our side, we reveal this gift, recognize it, thank the Creator for it, and thus bring Him contentment. Yes, He seemingly put us in a dark cellar, but at the same time, this is where we reveal all the beauty of the universe. With What Does Man Begin? Question: How can I see attributes, Sefirot, around me, and not people? Answer: Why do you see people in the material sense of the word? Why do you need faces? Does the body say something to you? It doesn’t say anything about the person. In fact, soon, we will stop relating to character traits also. A person gets them when he is born or acquires them from the environment. This is not him. His parents brought him into the world; he was educated in these institutions or others that he didn’t choose, and all his life, he is found in some environment. As a result of this, we see in him a particular form that is molded according to particular parameters. That is how they “made” him, and that is how he lives his life from beginning to end. This is not truly him. Don’t attribute anything to that. He doesn’t even have a grain of anything original of his own, not in the characteristics of his body and not in his character traits. Everything is a result of what he apparently receives from others. So, it follows that the external appearance of the person and his behavior have no meaning. What matters is his investment in a group and his efforts. For this, he may receive a response from above and acquire what is called man. There is one additional caveat: Even if the person doesn’t correct himself, he doesn’t live his life in vain if he helps in the correction of others, if he brings them closer to the truth. In any case, it is worthwhile to work on this as much as possible. As Baal HaSulam writes in the “The Last Generation,” the goal of life is to merit adherence with the Creator, to maintain strictly the general rule to act only for His good, or to help many to reach adherence with Him. In the News (from The Independent): “There’s a lot more to being bored than you might think, if new research is to be believed. “Science has known about four types of boredom for a while now, but a team of international scientists have now built on their research and discovered a fifth, “especially unpleasant” form of tedium. “Dubbed ‘apathetic boredom,’ it elicits a feeling of learned helplessness similar to depression. “Previously, it was thought that people could suffer from ‘indifferent boredom,’ in which people felt withdrawn but relaxed; ‘calibrating boredom,’ a feeling of uncertainty in which people are receptive to but do not seek out change; ‘searching boredom,’ which is restless and pursues distraction; and ‘reactant boredom,’ wherein people are motivated to leave their situation for a specific change. My Comment: This is a transition period from the egoistic lifestyle, with its natural energy, search, and competition aimed at obtaining at the expense of others, to the altruistic lifestyle of society, with its energy, exploration, and competition aimed at bestowal unto society and getting the fulfillment of the whole society. Ein Sof is the beginning. Everything descends to us from Infinity. There is a “pantry” of all delights the Creator wishes to give to the souls, the “treasure trove” of His attitude to creation, the “repository” of all forces, all the Lights and vessels. Our prayers, requests, and demands also rise to Infinity. All our aspirations are headed there. “Infinity” stands for His endlessly kind attitude to the good and the bad. Like the owner of the house, He grants everything to his guests except for the cancellation of the guests’ sense of shame. Creatures respond to Him; they ask and demand from Him anything they want. However, the system is set in a way that in order to get a fulfillment, one first has to be corrected. After the shattering of vessels took place, any fulfillment that precedes correction turns into poison and hurts us. Why doesn’t the Creator give anything to us for free? The fact is that if we are still immersed in egoistic desires, the Light becomes “poison” to us. This explains why the Creator is “unable” to give us the Light, since He just doesn’t want to torture us, even though He suffers because of this situation much more than we do. As a result, all we receive is just a tiny glow; anything more than that would be damaging for us. Question: How can I know anything at all about Infinity if it is the “Light without a vessel”? Answer: Actually, there is no such thing as the Light without a vessel. We are talking about a concept that states that the vessel doesn’t restrict the Light. In the world of Infinity, the Light is not constrained by a vessel. This is why it is called “Infinity – without end (Ein Sof)” There, the vessel is endless and so is the Light in it. Until the first restriction (Tzimtzum Aleph) occurred, the vessels were “round” and had no boundaries; they only contained points of perception that were distributed over four levels. Later, new types of vessels were created. They varied from the previous ones by the quantity of restriction they contained, by the measure of the screen (Masach) that rose above the restriction and by the amount of the reflected Light that rose above the screen in order to work in the same way as the Creator. The Creator wishes to give to His creation, but to what extent is the creation ready to accept for the sake of pleasing Him? It means that we should be delighted, thus giving the opportunity for the Creator to be pleased. We should be ready to receive anything from Him. We should be eager to “swallow” and “absorb” all His presents in the “round” vessel; however, we have to receive only according to a line rather than a circle. Actually, it is an extremely difficult limitation for us: It’s as if the Creator puts in front of us an endless table with all kinds of imaginable dishes. And our appetite is quite sufficient to eat all of them; there is no problem to swallow them all. But instead, I cut a slice of bread, sprinkle it with a pinch of salt, and drink half a glass of water. This is what the “thin line” is about: I am incapable of anything else. After all, I want to please Him and therefore cannot taste delicious dishes for my own pleasure. If I go over the “limit,” I’ll start enjoying. It’s impossible to “shape” our minds to the extent that we reach a “correct condition”… What can we do? How can we be satisfied with bread and water from such a lush table? Won’t we just disappoint ourselves and the Creator more? How can we restrict ourselves by declaring our own weakness? In fact, this is exactly how we should work with screens. This is the work that we should be doing. How can we justify it? Answer: So from our side we should keep the basic promise: “The end of an act is in the preliminary thought.” We should remain confident that we will reach complete correction after many small actions. We have to remember that spirituality is different from corporeality. In corporeality, we always want to see the results right away. Sometimes it’s the product we made: Suppose I made shoes; sold them, and received money for them. I see the shoes I made; I see the results of my efforts, the fruits of my labors. I can evaluate, improve, adjust, correct, and make them better only if we actually see them. It is said: “There is none wiser than the experienced,” and the experienced is earned with one’s own hands. We apply effort somewhere, and there we see the results of our work. So over time, through trial and error, I correct myself and become a professional, skilled craftsman. But the difficulty is that in spiritual work, we cannot see the results. Just imagine a musician who would strike the piano keys and couldn’t hear any sound. How could he play? When a child is taught how to write, he is given a notebook to enter letters strictly between the lines. But in spirituality, I have no “lines,” and even the letters I write are invisible! How can I adjust myself if I can’t see any response? I invest efforts, but they disappear like water seeping into sand. Well, let’s say, I’m willing to sacrifice any results for self-benefit. But I still have to somehow adjust, check, improve my work, and gain experience. How is it possible? It doesn’t work this way in spirituality. We don’t get any response, and this weakens us. I can’t make an effort that doesn’t cause any visible reaction. It’s like talking to a wall. All my energy vanishes. But the reaction does exist, only it doesn’t take place within the same desire; in other words, it occurs in a different place. If at least a tiny part of our efforts are correct, that is, if we have an intention to exit ourselves and connect with others, to get closer to the Creator and give Him the opportunity to disclose Himself to us, to bring Him joy without demanding or anticipating to get anything in return, the reaction accumulates. It turns out that the place of our work and the results we get are completely separate from each other. Should we ask to see the results of our work? If we see that we did something correctly, it will fulfill us and bring us satisfaction. It can stop me and hinder advancement because I start working for that gratification. But then how can I analyze the work I do and check that I am not driven by our self-interest? How can I see the reaction without enjoying it egoistically? How can I manage to accept the information only, without the sensation, without the desire to receive pleasure? This is called demanding a desire to bestow. In other words, I don’t even want to know if I am bestowing to the Creator because in my current state, I would inevitably enjoy it and be comforted. I just want to make actions, detached from enjoyment and fulfillment, not to bring calm to my desires, feelings, and thoughts. This takes work. The result of our spiritual work is called “a find.” The results show up as if at exactly the wrong time and in a place we didn’t expect it. And the result itself is separate from the desire; therefore, it is totally unexpected. Our friends are parts of our souls. The fact that we have joined the group is not accidental: We were brought to the group from above. We should realize that it is the Creator who gave us this particular set of friends. He is the one who “placed our hands” on a good destiny, and said: “Take it!” From now on, all we have to do is strengthen our connection and unity with others. Prior generations of Kabbalists were integrated in smaller groups, sometimes less than ten people. That’s how they revealed the Creator between them. However, our situation is quite different. Today, all of humanity is in a corrupt state; the entire vessel of the common soul has been shattered. This explains why we have to receive as many desires and needs from each broken fragment as possible. Then we have to “digest” them, rise together with them to the Creator, and demand that He be revealed to us. We should do it not for our own sake (1%) but for the external audience (99/%). Thus, we must be the Light guiding channel so that the Light of the Creator is revealed in us, and we pass It down to others. To do this, first of all, we should strengthen ourselves (1), then, we turn to the needs of the general public (2), after that, we appeal to the Creator (3). Then, the Light and the abundance will descend from the Creator to us (4) and we transmit it down (5). 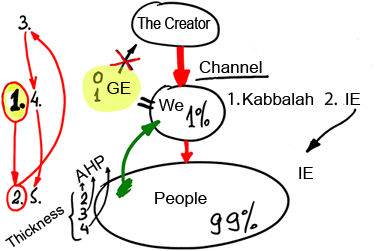 We study Kabbalah, and to the external audience we present Integral Education (IE.) Accordingly, we have to learn how to address the general public, in what form and style should we present IE materials, and what set of terms to use when talking with them. It is said: “Educate the child according to his way.” In other words, we educate people in a way that they can understand so that they will be attracted to us and not repelled. And then, to the extent of how many people will be drawn to us, we can involve some of them into the groups. We should be very gentle with them so we don’t scare off those who are not ready to join us. On the other hand, we are seeing the crisis, and we are obliged to address the entire world. Otherwise, we won’t reach spirituality; we won’t feel the necessity to appeal to the Creator. After all, we are only Galgalta ve Eynaim (GE), Hafetz Hesed, a very small part with very little “depth” of the desire, which is limited to the zero and first levels; whereas the entire humanity represents the AHP with the second, third and fourth degrees. So, if we don’t receive this great “thickness” of desires from the rest of the world, we will have nothing to address the Creator with. There is no other choice. In contrast to prior generations, we are simply obligated to “go to the general public,” accept their needs, and raise them above. In his articles “The Arvut (Mutual Guarantee)” and “Matan Torah (The Giving of the Torah),” Baal HaSulam writes that we have to serve the entire world as a transmission channel between the Creator and the nations. There is no place to learn how to do it; we are constantly developing the part of the methodology called Integral Education. Development is underway, and day by day we steadily advance. Question: While preparing for a dissemination project, I felt a very strong attraction and sympathy for the poor, but my ego tells me to work with rich and more influential people. I was confused and don’t know what the truth is. Answer: You should not work with the rich or poor but with those who want to hear more about what we are saying. As a rule, the poor want this more. Therefore, I recommend beginning to work among common people. In the meantime, I don’t see any possibility of working with those who are well-off and thriving. Only a few of them are ready to listen to us because wealth blinds and dulls a person. The ego doesn’t allow them to be detached from the good life. This fulfills and anesthetizes people. I suppose that the lower strata of the population who now are beginning to feel the crisis with great intensity are becoming that ground upon which we can develop integral education and the wisdom of Kabbalah among the people. We must specifically turn to them because we have a solution to the problem of the crisis. What is there to solve for the rich? Will he make a profit of ten million or five million dollars? Certainly he is sad and concerned if he has less profit, but these are not those concerns about which it is possible to give an answer, for our method subconsciously says that the person should be satisfied with a reasonable need and no more than this. For rich people, there is a very great need for large profits above the necessities. Our method speaks about this from the start: that a person doesn’t require anything besides connection in which he will feel the higher source of pleasure, the discovery of the Creator. The rich person immediately will ask, “And what about my millions,” and someone who has nothing to give up and lose will yearn only for the upper source without looking back. When Will Humanity Finally Listen To Us?